NEW YORK (NYTIMES) - Their big trip to New York had been decades in the making. Thirty years ago, when they were all still high school students in this industrial city in Argentina, 10 young men promised to celebrate their reunion somewhere in style. "In 30 years, we have to go on a trip," said Cristian Ciancia, a fellow graduate, recalling the pledge. The friends eventually settled on New York, but the cost was too high. So Ariel Erlij - one of five Argentines killed in the terrorist attack Tuesday in Lower Manhattan - did not think twice before helping to pay for flights, friends said. "When any friend, any acquaintance, needed anything, he never hesitated to offer a hand," said Ciancia, who was not on the trip. Finally, the 30-year promise was coming true - until the unimaginable happened. A motorist mowed down cyclists and pedestrians on a bike path along the Hudson River Tuesday afternoon, killing eight people, including half of the group from Argentina. "We don't understand how there can be so much evil in the world," said Alejandro Luca, a close friend and business partner of Erlij. The Argentine friends had been inseparable in high school and had remained close over the years, even as two of them moved to the United States. Last Saturday, eight of them set off to the United States from this industrial city northwest of Buenos Aires. 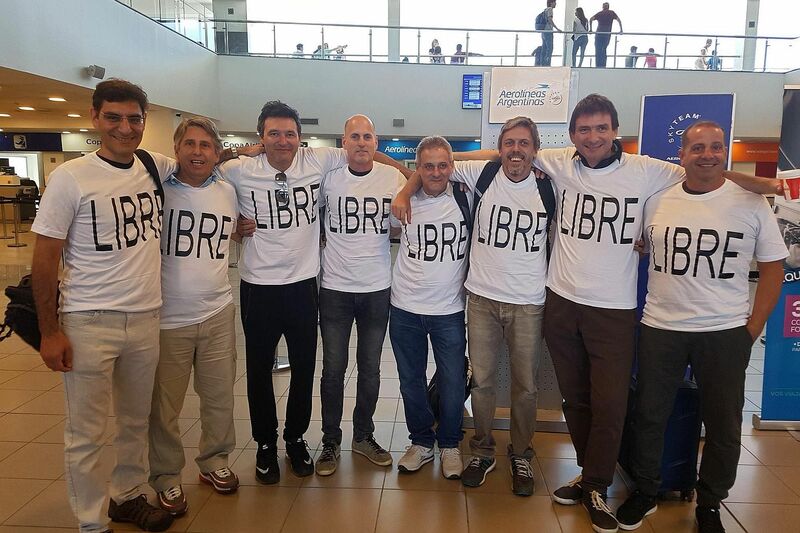 Before boarding a flight, they looked giddy as they posed for a photograph wearing matching white T-shirts imprinted with "LIBRE," or free, in large black letters. The T-shirts were Erlij's idea, borne out of a joke made in a group chat on WhatsApp about what it would be like for this gaggle of friends, now in their late 40s, to be inseparable again, for a few days, without their wives. The other trip participants who died were: Hernán Ferrucchi, Alejandro Pagnucco, Hernán Mendoza and Diego Angelini, all architects, according to the Argentine newspaper Clarín. The survivors were Martín Marro, who lives in Massachusetts; Guillermo Banchini, who lives in New York; Iván Brajkovic; Juan Pablo Trevisan; and Ariel Benvenuto. Pagnucco's son, Ornee Pagnucco, said in a brief interview conducted over social media that the reunion participants had "shared videos and photos with a lot of emotion". His father was "a great man and the best father in the world," Ornee Pagnucco said. "I'm in a very ugly moment of my life." Officials at the three-storey school, which has marble staircases and high ceilings, were devastated. Bibiana Vignaduzzo, a regent and physics teacher, shared memories of the men, who had taken her technical mechanics class in 1986. "All 10 of them were great friends back then," Vignaduzzo, 58, said in an interview. "If there's something I remember about them it is that they were all big jokers. It wasn't mean-spirited, but they were always joking around with each other and their classmates." Alicia Oliva, a deputy director at the school, said groups of friends who graduate from the Politécnico in Rosario often remain close. "This group wasn't an exception," Oliva said. "Lots of our students form bonds that last a lifetime and they still see each other, go on vacation together." On Tuesday, the school day began with a minute of silence at 7.30 am. "Everyone was very respectful," Oliva said. "I told the students it was an opportunity to reflect on the importance of community and tolerance." That message resonated for Agustín Riccardi, 18, the student council president. "There is a lot of consternation because when I stopped and thought about it, I would love to go on a trip with my classmates 30 years from now and for a reunion like that to end this way is just devastating," he said. "Even if we don't know the victims, we know they're fathers, uncles, cousins of people we know. This is a small community." Erlij, the trip's organizer, was a successful steel entrepreneur and real estate investor. Even as the father of three amassed considerable wealth, friends said, he remained simple in his manners and tact. "He had a big heart," said Luca, the friend and business partner. "They're no one who's not mourning him here." City officials Wednesday declared three days of mourning. A candlelight vigil was held after sunset outside the school. Residents of Rosario, a riverside city of about 1 million people, described feeling an overbearing sense of loss. "I couldn't stop crying last night and I wasn't alone," said Nelida Riqué de Jordán, 84, as she drank a coffee downtown. "Rosario is mourning. These were our Rosario brothers." Jorge Casals, 59, a systems engineer, said the horror of the news dominated conversations at work and seemingly everywhere in Rosario on a hot spring day. "I heard lots of people ask, where is it safe to travel now?" he said. "A friend told me this had convinced him not to go to the World Cup in Russia." Ana Luz Pailer, 20, an architecture student, said the attack made her feel vulnerable. "Something like this really makes you think about how fragile life can be," she said. "It really does feel like it could have happened to any one of us."